Among the Bavarian rulers of the house of Wittelsbach there were many with a lively interest in culture and the arts. Maximilian II (1811-1864) felt drawn to the world of academia. Thus, the King, who would have liked to become a professor of history, brought many famous scholars from all over Germany to the university of his capital city. In addition, he founded the German National Museum in Nuremberg and the Bavarian National Museum in Munich, reformed the school system and established the foundation that bears his name. The idea to create an institution dedicated to supporting students came to Maximilian in his days as Crown Prince. 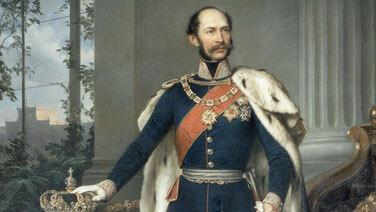 When he ascended the throne in 1848, he began to implement his ambitious project. Parliament, however, did not grant him the funds required. Therefore, it was with his own money that Maximilian founded the Athenäum in 1852 (see Hausordnung - document only available in german). Five years later it was renamed Königliches (Royal) Maximilianeum. The attribute "Royal" vanished in the course of the revolution of November 1918. Since then the institution has had its current name. The King wished the 26 best grammar school leavers from all parts of Bavaria to join the upper echelons of the civil service, regardless of their social position or their parents' income. To this end he made it possible for those who had passed the rigorous entry examinations of the Stiftung Maximilianeum to study at the University of Munich without having to worry about money. While, at the beginning, Maximilian required his scholars to study law, from 1860 onwards he allowed most other subjects, too. The only exceptions to this very day are medicine and theology for those who would like to become priests. While the first scholars under director Hannecker (see Vorstände) lived in a simple block of flats near the University, since 1874 the Foundation has had its seat in the Maximilianeum, an impressive Neo-Renaissance building, which marks the eastern end of the Maximilianstrasse. Until 1918 the students shared the house with the members of the Royal School for Pages, and up to World War II there also was a public gallery in the Maximilianeum. On display were thirty history paintings and twenty-four marble busts of famous people from the history of mankind. The Stiftung went through its most turbulent years between the two World Wars. Admittedly, it survived the abolition of the monarchy unscathed. 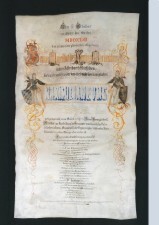 For Max II had decreed that in this case the post of protector should pass from the King to the President of the Ludwig-Maximilians-Universität (LMU) in Munich. However, the great inflation of the 1920s dealt a heavy blow to the institution, which lost almost all its money, about 1.5 million Reichsmark. As the Stiftung could not survive on the entrance fees of the visitors to the gallery, parts of the building were let and the students had to pay for the privilege of living in the Maximilianeum. In the Third Reich the Foundation was not only still out of funds but it was also faced with massive attempts to bring it into line. However, the Stiftung was able to protect its independence and successfully thwarted all plans to have NS party institutions move in. The Stiftung as such kept its distance to the new regime and with Eduard Hamm (1879-1944), who had been German Minister for Economic Affairs between 1923 and 1925, it lost one of its members in political imprisonment. However, there were some Maximilianeers who joined the Nazi movement. For example, Theodor von der Pfordten, born in 1873, was one of Hitler's henchmen who were shot in front of Munich's Generals' Hall in 1923, and Franz Gürtner (1881-1941) was the German Minister of Justice between 1932 and 1941. As the building had suffered considerable damage in World War II the Stiftung was confronted with insoluble financial problems. It was not until 1949 that the crisis was resolved. 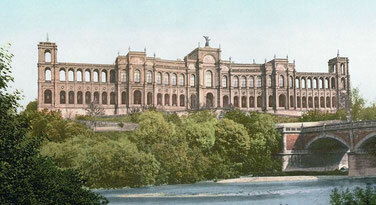 In that year the Bavarian Parliament, consisting of the Landtag (Lower Chamber) and the Senate (abolished in 1999), moved into the Maximilianeum. The Stiftung was saved, and Parliament had found a stately new home after its old, not particularly remarkable seat in the city centre had been destroyed in the war. Until today, the symbiotic relationship between Parliament and Foundation has been a success. Since there were not enough rooms to house the new members, for fourteen years they lived in a nearby boarding-school. In 1994 a spacious annexe to the Maximilianeum was finished. Since then all members of the Foundation - on average 45, roughly half of whom are women - have been living together under one roof in the Maximilianeum.